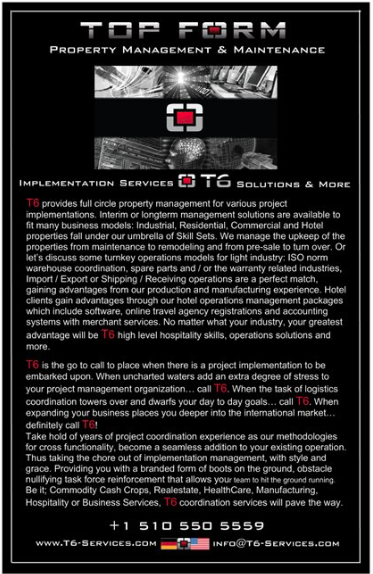 T6 provides full circle property management for various project implementations. 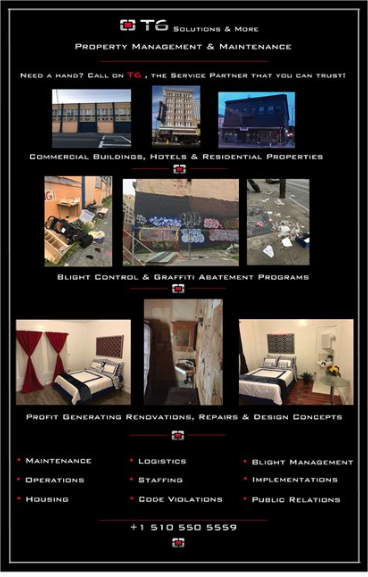 Interim or longterm management solutions are available to fit many business models: Industrial, Residential, Commercial and Hotel properties fall under our umbrella of Skill Sets. We manage the upkeep of the properties from maintenance to remodeling and from pre-sale to turn over. Having trouble with potential Blight ordinance violations? Quickly call T6! Or let’s discuss some turnkey operations models for light industry: ISO norm warehouse coordination, spare parts and / or the warranty related industries, Import / Export or Shipping / Receiving operations are a perfect match, gaining advantages from our production and manufacturing experience. Hotel clients gain advantages through our hotel operations management packages which include software, online travel agency registrations and accounting systems with merchant services. Technology always travels with T6, using technology to show strength and innovation at trade shows and meetings always creates a great impact on attendees. Yes...we are also skilled event planers! Try us for your next Tenant PR event or a political housing event. No matter what your industry, your greatest advantage will be T6 high level hospitality skills, operations know-how, solutions and more. T6 is the go to call to place when there is a project implementation to be embarked upon. When uncharted waters add an extra degree of stress to your project management organization… call T6. When the task of logistics coordination towers over and dwarfs your day to day goals… call T6. When expanding your business places you deeper into the international market…definitely call T6! Take hold of years of project coordination experience as our methodologies for cross functionality, become a seamless addition to your existing operation. Thus taking the chore out of implementation management, with style and grace. Providing you with a branded form of boots on the ground, obstacle nullifying task force reinforcement that allows your team to hit the ground running. Be it; Commodity Cash Crops, Realestate, HealthCare, Manufacturing, Hospitality or Business Services, T6 coordination services will pave the way. T6 Maintains a close relationship to technology and applies it as an ally in all situations pertaining to project implementations. T6 comes standard with Satellite Office set ups. This allows us to enter a location and start processing data with very little down time. In fact, every step taken plays a part in creating a better future for the Project Management Organization. Keeping our finger on the pulse of this technology allows us to design custom databases and cloud based solutions in house, thus saving thousands of client dollars. T6 can catalog all of your facility expenses so that there is less work for your tax accountant. T6-Notary, at your service: when and where-ever you need us to be. We travel to your location well prepared to perform our duties as described by the California Secretary of Sate, day or night! Experience T6 project management and logistics coordination by the hand of T6-founder and director: International Product & Project Implementation Specialist Mr. Dion Ross. Trade-shows, Corporate Functions, Meetings and Events of various styles. Let T6 help with your event management needs. From start to finish place yourself in the capable hands of professionals that have been there and done that! T6 can help to enhance your attendees overall experience ratings thus creating the foundation for achieving your goals. Keeping our eyes open and our fingers on the pulse, T6, takes your safety and security very seriously, We also never under estimates the power of the palate. Finally here and back by popular demand at $99 per pair! Dumbbells are a fundamental element in creating a system for core training. With the modular system the flexibility is all yours. Adjust the Dumbbell to the desired configuration with in moments. T6 Paving the way for this cash crop client. This is a full scale project from farm to roaster! Years of experience in Health Care have paved the way for a new Block Chain Process. Top Form and a dynamic team of T6 professionals are working together to improve the current flow used by care providers and service providers. Though highly top secret at this stage, we are proud to say that four of our project managers were directly involved with Kaiser Permanente's very successful "ONELINK" & "CLAIMS-CONNECT" projects. We look forward to reporting amazing news on this front! We transform that heap of non-productivity into profits with the lowest possible down times! At T-6, nothing goes to waste! We can combine parts of broken items to create functioning inventory. T6 can manage repairs and parts inventory storage. We can also work with your inventory team for drop shipments or directly with item manufacturers and parts producers in China/worldwide to fulfill parts requests on your behalf. From GPS module to ball-bearings T6-Services has you covered down to the wire. Don't write your asset off too soon. Save yourself the trouble, let T6 prepare your fleet and initialize your GPS modules while providing you a detailed inventory list by QR and Bar Code! Street Ready in a Snap! Charge 300 units simultaneously! Your fleet doesn't earn money if it is not out on the street and ready action... Get T6! T6-planned this amazing party for silicon valley giant SAMSUNG and we can do the same for your organization on a larger or smaller scale. From design concept to delivery, T6 takes on the heat so you can concentrate on your business and your attendees. Let T6 show you what fun looks like! Dramatic changes, Bringing your vision to life every step of the way. Make our office your own satellite communications center. T6 Business services lends you a hand where you need it most. Marketing, Data management, Expense reconciliation and more! T6 presents: 1900, the Venue...for those individuals who need to host a pop-up event. T6 has the perfect solution! Perfect for Construction Teams, Live-work professionals, Students, Meetings, Training, Satellite sales presentations and more. Visit our full service Shipping & Business Center...coming soon! We are on a bold mission to help others upgrade their lives. Let's discuss some options on how T6 can assist you.